This is the end-of-year report for the technology department and a summary of all that has been accomplished from June 2015 through June 1, 2016. Keep in mind that these totals do not include all the phone calls and last minute emergencies. We appreciate our ticket system for helping us be more efficient in helping you with technology problems. June--Began summer jobs and schedule. Helped setup for Summer School. Technology staff attended the TCEA Area 7 Conference in White Oak. Annette made a technology presentation to the CISD School Board. 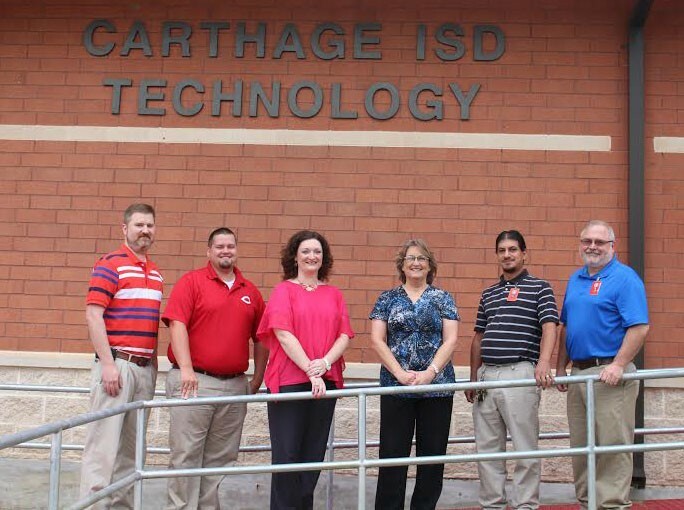 Technology staff participated in online technology courses through Region VII. Richard and Annette attended Library Conference at Region VII. July--Continued to support CISD staff with monthly newsletter, Tech Bytes. Introduced a new Google app each month. Went classroom to classroom cleaning projector filters. Helped custodial staff move computers out for summer cleaning. Then reassembled computers into classrooms. Assisted with state-wide online retesting. New website became Live to the public. August--Offered Gmail refresher for returning staff and Gmail training for new staff. Assisted Region VII with Back-to-School Conference at CHS. Sent out Google Form to all staff to assist with back up information on all technology inventory in each classroom/office throughout the district. Video conferences offered for TxGradebook Administrator training as well as training for teachers. Uploaded files for the new year including: DMAC, Renaissance, TxEIS, txGradebook, SchoolMessenger and iStation. Created login accounts and emails for new staff. SharpSchool training for webmasters. Terry performed a TxEIS rebuild and backup. September--Completed wireless upgrades throughout the district through Erate funding. Annette, Terry and Richard participated in the Region VII Tech Meeting via video conference. Annette and Terry participated in TSDS training at Region VII. Terry installed TxEIS Summer Release & Patch 2.0.0004 Builds 0086/0087. Terry installed TxEIS Summer Release Patch Only 2.0.0004 Build 0088 and rebuilt database. Annette installed DMAC upload #2. October--Digital Citizenship Month is the time that we teach our students about the importance of online safety, etc. Each campus uses Common Sense Media lessons that are grade level appropriate. Terry rebuilt database and installed TxEIS Summer Release Patch #3 2.0.0004 Build 0093 and installed txSuite Summer Update version 2.10.1. Annette submitted DMAC upload #3. November--All teachers and principals participated in the TEA Star Chart Technology Survey. Debby, Richard and Annette participated in Erate training via video conference. Terry updated TxEIS and rebuilt database. All Technology staff participated in the district-wide Academic Extravaganza at CHS and assisted with setups. December--All staff participated in the Project Tomorrow Speak Up Technology Survey. Terry rebuilt TxEIS database and installed Rebuild Summer Release Patch #8 (TxEIS 2.0.0004 build 0103). Submitted Erate forms 470. January--Formed Tech Committee and surveyed for the upcoming 3-year Tech Plan. Resubmitted Erate form 470 for internet services. Terry, Richard, and Annette participated in Region VII Tech Meeting via video conference. Annette submitted DMAC upload #4. February--Completed the 3-year Tech Plan. Assisted with TELPAS calibration setups. Assisted with CHS Career and Tech Fair setups. March--Board approved 3-year Tech Plan. Submitted the plan through ePlan on the TEA website. All tech staff assisted with state wide online testing. Annette submitted DMAC upload #5. Richard and Annette attended Region VII Tech Meeting via video conference. April--Assisted with state-wide online testing (TELPAS & STAAR ). Richard and Mark attended Google Admin. training at Region VII. Terry rebuilt TxEIS database and installed TxEIS Winter Release Patch 2.0.0005 Build 0124. Terry, Richard, Mark, and Martin assisted with Track setups. May--Terry assisted with Century Club setups. All staff assisted with state-wide online testing from May 2-13 on four campuses. Staff assisted with many end-of-year banquets, concerts, and events. Annette submitted DMAC upload #6. Annette uploaded files for the opening of FitnessGram. Please remember to put in work tickets if you have technology needs in your classroom this summer. The technology department will be re-imaging computers over the summer. Please be sure that all files are saved in your My Documents folder or your Google Drive. Remember if you save them to Google Drive, you will have access to them anywhere you have internet access. If they are saved to the desktop only, you will lose these files. Also be sure you don't leave any CDs or DVDs in your computer over the summer. The technology department is open in the summer Monday-Thursday 8 am-4 pm.